Las Olas Villa is located in the Las Olas Resort area of Playa La Barqueta in the Province of Chiriqui and near the city of David. 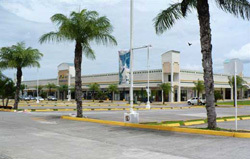 Most people travel to the David airport from Panama City. You can also get flights to David thru Costa Rica. The Las Olas Resort Master Plan below will show you the location of the villa, the Resort and the Golf and Tennis Club that is under construction now. Flying to Panama City. Tocumen International Airport (PTY) is the main airport in Panama City. Regular flights come in from the USA daily. It is common to get flights through Miami, Atlanta, Houston, Los Angeles and other major US cities. Once in Panama City you can catch a connecting flight from Albrook (PAC) Airport from 2 different airlines, Air Panama and Aeroplas. They both provide multiple daily flights to DAVID (DAV). Once in David's Enrique Malek Airport, you can rent a car, van or SUV at the airport from any of the major car rental places that are on site. Once in David. It is a short 20-25 minute drive out of David to the Las Olas Resort area. There are large Las Olas billboards and directional arrows to the Las Olas Resort area all the way out to the resort from the airport. Just follow the big signs. Maps are also available at the David Airport car rental businesses. 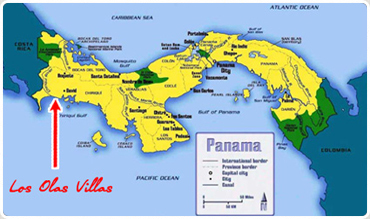 David is the third largest city in Panama and the capital of the Chiriqui province. There are major shopping centers, restaurants, hospitals, grocery stores, night clubs, discos, and basically anything you need is there. Once you drive out of town towards the Las Olas Resort area, you will see a beautiful farmland area rich in Panamanian culture. LAS OLAS VILLA and LAS OLAS RESORT. Once you make the drive from DAVID out to the LAS OLAS RESORT area, you turn left past the resort to the LAS OLAS VILLAS. Once in this area, you will see Barqueta Nice which is a residential Ocean Front community with hundreds of Oceanfront and Second tier homes. Las Brisas Del Mar is the first condominium complex to be completed at the LAS OLAS RESORT area and another complex, Estrella Del Mar is ready to break ground. LAS OLAS RESORT is a 42 room 5 star resort that is the anchor of the community. The new Golf Course and Tennis areas are under construction and will be ready soon. Be sure to enjoy a dinner at the Resort, stroll the beach to a friendly local restaurant and begin your vacation watching the spectacular sunsets! Enjoy your stay at the LAS OLAS VILLA. One of the fastest growing cities in the world. Visit the canal, spend the night at one of the hotels or casinos. Taking time to visit this city is another item to add to your vacation plans. David Panama is in big part a market town, serving as a center for the region's rich farming industry. It was founded in 1602 under the Spanish governor, Juan Lopez de Sequeiro. 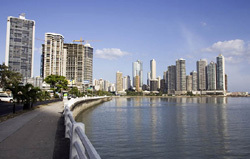 It is the third largest city in Panama. With major banking, shopping, hospitals, it offers all the comforts of home. The friendly people are happy to see you and many speak English. The LAS OLAS VILLAS are next to the LAS OLAS RESORT in the Playa La Barqueta area in the Republic if Panama. These are 20 exclusive villas that are all ocean front properties. With the new Las Olas Golf and Tennis Club, the LAS OLAS VILLAS are fast becoming one of the most desirable ocean front locations to vacation in Central America. An exclusive area of 20 Villas that will be the corner stone of the Las Olas Resort and Golf Club. These are 2/3 acre beach front lots and this community will be gated and is directly next to Las Olas Resort. This gated community of ocean front lots has been established for several years. 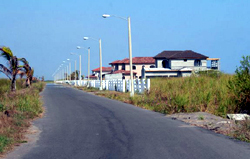 With hundreds of ocean front lots in this community, many are occupied with permanent and vacation residents. The 1/4 acre ocean front lots are ready to build on today. These are 1/4 acre lots across the street from the beach and have ocean views. The most affordable of the lots in the Las Olas development, these lots offer fantastic ocean views to the front of the lot and views of Volcan Baru to the rear of the home. Video showing you this ocean front villa and ocean views.